Meanwhile, the number of broadband internet users reached 214 million people and represents the largest broadband user base in the world. The CNNIC report also reveals that as of July 22nd, the volume of CN domain names reached 12.188 million, which makes it the largest national top-level domain in the world. 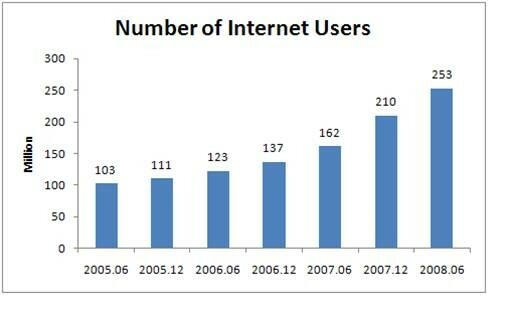 The growth of China's internet users sustained high-speed. Compared with the same period last year, the number of internet users in China increased by 91 million people, which is the highest absolute growth of users over the past years. The year-on-year growth rate reached 56.2 percent. Alone in the first half of 2008 the number of internet users increased by 43 million people, overtaking the U.S. in one stroke and becoming the world's largest internet population. Statistics show that China now has a total of 1.919 million websites. The annual growth rate was 46.3 percent. The vast majority of these sites, 1.368 million or 71.3 percent, are domestically registered using a CN domain name. With the gradual expansion of the scale of internet users, the educational background of internet users approaches the educational background of the overall population. The proliferation of the internet results in a downward trend regarding the educational background. With a 39 percent share high school graduates make up the the largest percentage of internet users. The current top applications in the Chinese internet are music, news, instant messaging, videos, search engines, e-mail, online games, blog/personal space, forum/BBS and internet shopping. The report shows that the news utilization rate hits 81.5 percent, which translates into 206 million users. The rate of online news readers increased by 8.8 percent compared to December 2007 and ranks now 2nd place among the top internet applications. In the last CNNIC report entertainment applications have been dominating the top 10 applications. However, due to a series of major news events in the first half of 2008 (heavy snow storm during Chinese New Year, Wenchuan Earthquake, 2008 Beijing Olympics) the internet as a news medium has developed significantly. In economically developed areas internet users have begun to accept online shopping, internet banking and online payment. China's online shopping penetration rate reached 25 percent or 63.29 million people, whereas Shanghai is the most popular citiy with a 45.2 percent online shopping penetration rate. The utilization rate of online payment and online baking reached 22.5 percent and 23.4 percent respectively. The acceptance of online payment and banking will greatly facilitate the development of online shopping in the future. Online payment reached 23.79 million users in the first half of 2008, which signifies a growth rate of 71.7 percent. Another development trend for the future is mobile internet, which will speed up the popularization of the internet in China. In the past six month 28.9 percent of internet users (73.05 million) have used a mobile phone to go online. 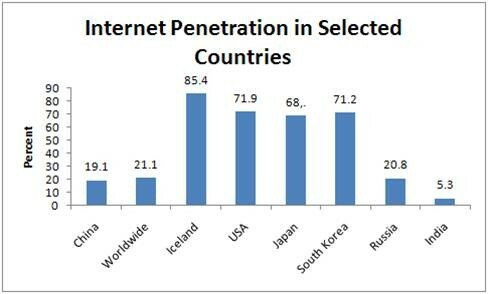 Overall the report shows that China's internet is coming of age and in the future its social influence will be stronger. Moreover, several internet applications are already deep-seated and the acceptance of online applications has increased substantially.